Whether your rug is a family heirloom or just a cherished part of your interior décor, seeing a tear, spotting a snag or noticing missing fringes can be devastating. What are you supposed to do if your rug is damaged? Throw it away and purchase another? Of course not. You’re supposed to call KIWI’s Phoenix rug repair team so you can fix issues stemming from rug binding, surging, backing and more. Our Phoenix team can clean and repair any complex rug weave pattern, so no matter how tired and worn your rugs look, we’ll fix them the right way. 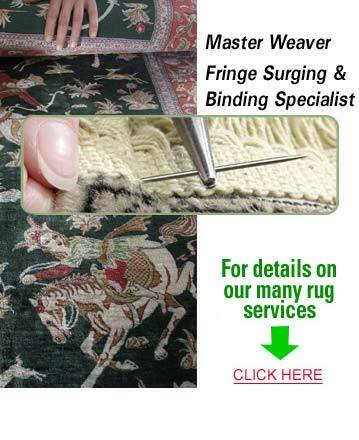 Our highly qualified and talented rug repair experts will be happy to evaluate your rug and make any necessary repairs. Just call us at 602-419-3589 to set up your appointment today. Don’t forget about our 30-day clean carpet guarantee. You’ll be glad you asked us about it!